Tweet Share In The Religion of Technology: The Divinity of Man and the Spirit of Invention, David Noble investigates the Western relationship between religion and technology. 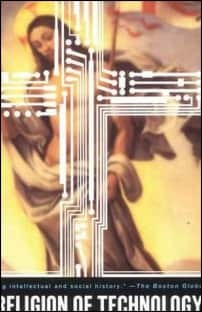 In The Religion of Technology: The Divinity of Man and the Spirit of Invention, David Noble investigates the Western relationship between religion and technology. Millenarianism — the belief in the end of this world and the coming of the next — is, in Noble’s view, a key driver of early proto-scientists, at least those in seventeenth-century England. There was, he argues, a sense at the time that the Fall of Adam from Eden “could be reversed” (45). He describes these “Puritan Baconians” and their utilitarian and millenarian outlook as giving formative shape to modern science. He argues that these early scientists were really technologists: the early founders of the “new scientific academies … tended to view science as technology … as an enterprise … bound up … with the useful arts” (57). Noble suggests, though, that these “founders of modern science” eventually moved away from earlier views of recovering Eden and, “with increasingly more hubris than humility,” began to speak of achieving of an understanding of divine creation itself, instead of the lesser focus on Adam’s knowledge characteristic of earlier times (62). In other words, they moved from being content with a focus on technology and “what works” to become scientists focused on questions beyond the materialistic. This was very different from earlier views of “God in nature” that earlier hermetic and alchemical traditions — predecessors of modern “technoscience” — held. In his descriptions of eighteenth century European science, Noble continues to emphasize the importance of millenarian beliefs to the science and technology of this time. For example, Joseph Priestly, known for his work in electricity and with oxygen, insisted on the connections between his scientific work and his religious views, which included a belief in prophecy and Revelation. Priestly focused on the “practical application of science” to further the goals of “both immediate utility and millennial preparation” (71). But it was not just Priestly. Religious belief generally motivated early scientists in this time, according to Nobel, who writes that Michael Faraday, known for his work with electricity, was involved in a sect of fundamentalist Christianity that focused on a very literal interpretation of the Bible (71). Charles Babbage, mathematician and industrial inventor, also focused on arguments “in favor of religion” (72). For Noble, religious belief and scientific pursuits were both unified and mutally supportive — at least in the minds of eighteenth-century European scientists. Noble next moves into what I think might be the most intriguing aspect of this section of his work: his investigation of the role Freemasonry, including its “devoutly religious” — if anticlerical — beliefs, played in fostering scientific advances and improving the “useful arts” (77). As the eighteenth century progressed, the technological Freemasons proved to be “among the earliest advocates of industrialization” and served as “midwives” at the birth of the “latest incarnation of spiritual men, the engineer” (79). Noble writes: “As the founding fathers of both the engineering profession and engineering education, the Freemasons passed on the legacy of the religion of technology to modernity’s ‘New Man’” (79). Moving into nineteenth-century science, Noble turns his attention to Auguste Comte and his positivist system. Positivism, he argues, is “strikingly reminiscent of the Christian goal of a transcendent recovery of mankind’s original divine image-likeness and dominion over nature” (84). As with the millenarians, writes Noble, for positivists the “world’s transformation was inevitable and imminent” (84). Marx and the socialists shared Comte’s “technology-inspired millenariasm” and carried the old beliefs forward into a “new secular age” (86). Comte and the positivists may have rejected nineteenth-century religion as unscientific, but, according to Noble, the scientific worldview they adopted instead was remarkably like the religion it replaced. In a later chapter he calls “The New Eden,” Noble turns to America, where he believes “the useful arts became wedded to Adamic myths and millennial dreams” as “nowhere else before or since” (88). In America, “scientific and industrial revolutions followed in the wake of religious revival” (90). Technological inventions in America carried with them religious meanings. The telegraph, for example, was viewed as “divinely inspired for the purpose of spreading the Christian message farther … bringing closer and making more probable the day of salvation” (94). In nineteenth-century America, religion and technology were neither distinct nor disconnected; instead, they both reinforced and strengthened each other. 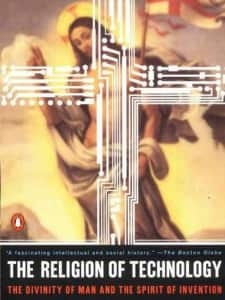 But despite this deep connection between technology and religion, religion in the twentieth century moved away from being a driver of both technological invention and scientific innovation. Increasingly, religion has been seen as oppositional to science and technology. Still, for many Christians this opposition is uneccessary and even problematic. For example, Noble explains tht NASA — at least into the Shuttle years — contained many devout Christians who saw their missions to space in deeply religious terms, and saw no conflict between their scientific and religious missions. But what can one make, then, of the Young-Earth Creationismisms rejection of geological and evolutionary sciences? Or the ongoing attempts by Christian evangelicals to “teach the controversy” of evolution in high-school classrooms? Does this kind of fight prove Noble’s integration thesis wrong? While I don’t think Noble fully answers these questions, his focus on technology perhaps suggests an answer. Science — or at least, some kinds of science — are not easy for some modern Christians to accept. But technology, even missions to the Moon or Mars, are much more readily reconciable with faith. They are, in older terms, explorations of God’s world, not challenges to God’s supremacy.